Total Los Angeles home sales in 2018 were 11 percent below 2017, with the decline driven by fewer sales below $1 million, down by 18 percent. Higher-priced sales fared similar to 2017. Fewer sales were seen across the region except for in South L.A. and Malibu. The year 2018 saw a strong increase in sales priced between $1 million and $2 million in Mid L.A./Baldwin Hills and Northeast L.A., both up by about 70 percent from 2017. The region’s 20-month year-over-year decline in inventory finally reversed in the fourth quarter of 2018 and posted an 8 percent annual increase, though inventory still falls below fourth- quarter levels observed in 2016 and 2015. While more inventory was seen in the San Gabriel Valley communities of Pasadena, Eastern Cities, South of 210, and the East Valley, West L.A., the West Side, and Silicon Beach also saw supply gains. 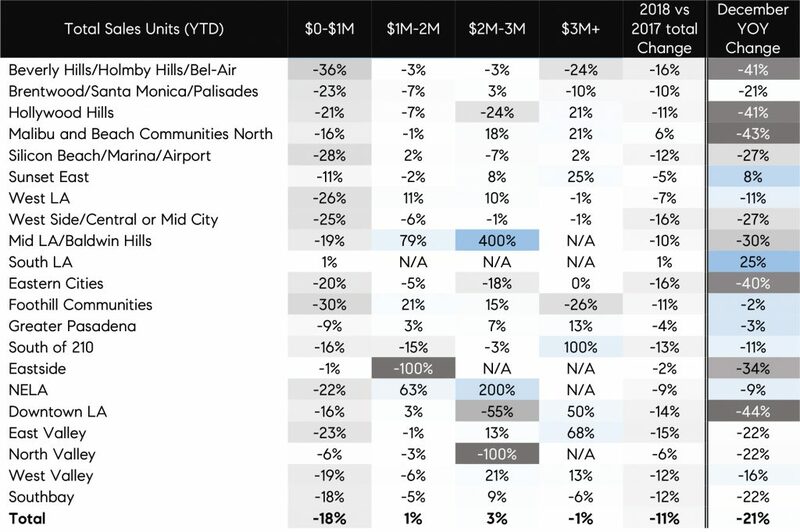 In contrast, more affordable areas of South L.A. and the Eastside posted inventory declines. Importantly, the inventory of homes priced below $1 million increased by 6 percent from the fourth quarter of 2017 — which translates to 251 homes — largely from the East Valley, the Southbay, and West LA. While the year started strong, it ended with a notable decline in buyer competition, leading to fewer homes selling for more than asking price. In December, only 30 percent of homes sold for premiums, down from May’s four-year peak of 48 percent. Sellers have adjusted their expectations, as price reductions reached a four-year high of 33 percent in December, compared with an average of 26 percent seen in last three Decembers. Los Angeles’ 2018 median home price increased by 8 percent on an annual basis. The Eastside, South L.A., Mid L.A./Baldwin Hills, West L.A., the Westside, and Malibu all posted double-digit percent price increases, while Beverly Hills and the Hollywood Hills ended 2018 with median prices on par with their 2017 levels. With more inventory, lower mortgage rates, and more price reductions, buyers are looking at a relatively more favorable 2019.
in sales over 2017, and South L.A., with a 1 percent increase. The decline in activity was mostly driven by fewer sales of homes priced below $1 million, which dropped by 18 percent from the previous year. However, areas with relatively more inventory in that price range throughout the year fared better, such as South L.A. and the Eastside. fueled price growth in 2018. A relatively larger buildup in inventory was seen in the San Gabriel Valley communities of Pasadena, Eastern Cities, South of 210, and the East Valley, along with West L.A. the West Side, and Silicon Beach. However, some communities continued to post annual declines in inventory, namely Malibu areas, a trend that may have been driven by the aforementioned wildfire. Inventory declines were also dominant in South L.A. and the Eastside, both areas perceived as more affordable and where 2018 sales activity remained relatively consistent with 2017. Figure 2 illustrates changes in fourth-quarter year-over-year inventory by Los Angeles community and price range. While all price ranges posted more inventory, the supply of homes priced between $1 million and $2 million saw a relatively larger increase compared with the end of 2017, up by 15 percent. Only Malibu and the Hollywood Hills lacked more inventory in this price range. And for homes priced above $2 million, while increases appear larger in areas like Mid L.A., the increase comes off of a low base. The overall supply increase in the Los Angeles region was driven by more homes on the market from Beverly Hills toward western part of Los Angeles. homes), the Southbay, (up by 60 homes), and West L.A., (up by 52 homes). been sitting on the sidelines. Further, the stalling housing market conditions that characterized the end of 2018 were driven by number of uncertainties, including political jitters, financial volatility, and concerns over the future of economic growth, but also by consumer perception that housing market has peaked. Consequently, buyer hesitance at the end of the year helped reset seller expectations and rebalance the relationship between the two sides. In other words, the competitive buyer spirit that characterized the first half of 2018 — when almost half of homes in Los Angeles sold over the asking price — waned in the winter. Figure 3 illustrates the three-year trend of the percent of homes that sold for more than asking price. In December, only 30 percent of homes sold for premiums, and while seasonal declines over the last three Decembers generally led to a similar rate, 2018’s decline was relatively larger — 18 percentage points, down from a 48 percent peak in May. The resetting of seller expectations is also reflected in more price reductions that were seen at the end of 2018. 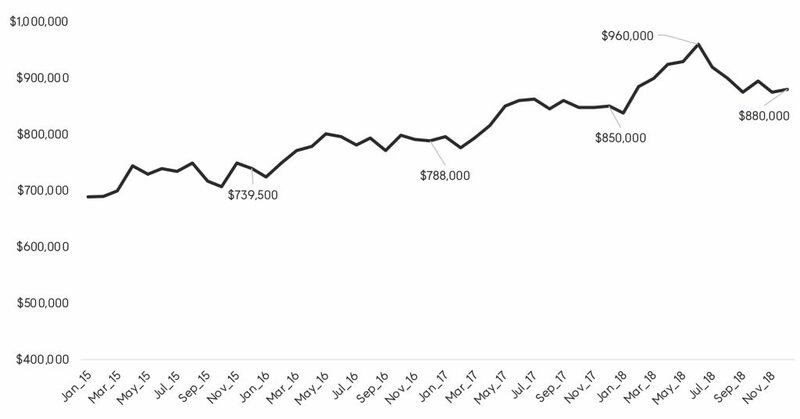 Figure 5 illustrates the three-year trend of the percentage of homes that sold with a price reduction, which reached a multiyear high December at 33 percent. Again, the previous years’ Decembers generally posted seasonal highs that averaged around 27 percent. 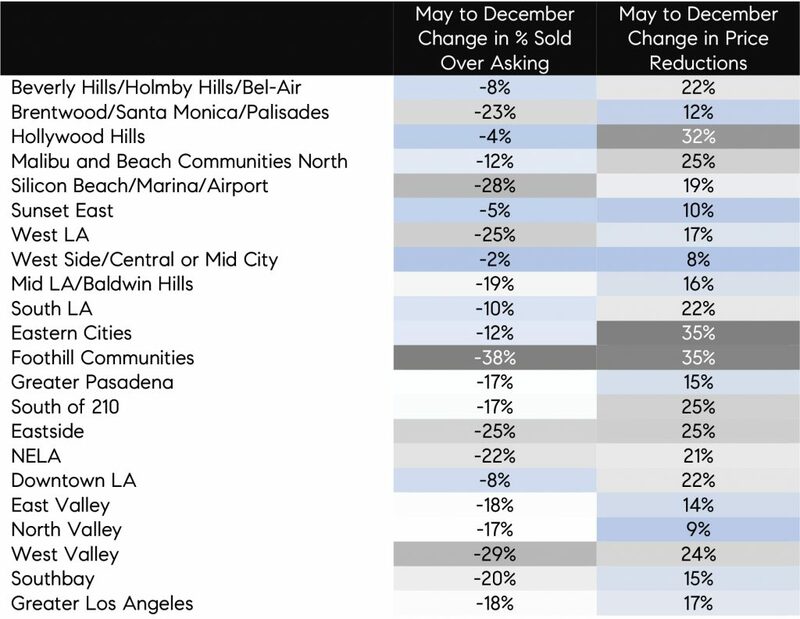 Figure 4 also illustrates the changes in the share of homes that sold with a price reduction between May and December by Los Angeles community. The buyer-seller rebalancing was again most notable in Foothill Communities, with a 35 percentage point increase in price reductions, from 13 percent in May to 48 percent in December. Lastly, with the market rebalancing and more inventory, pressure on home price growth slowed considerably during the winter, from the year’s high of $960,000 in June. Los Angeles’ median price, however, still increased by 8 percent overall in 2018. Figure 6 illustrates the multiyear trend of greater Los Angeles median home prices, which ended the year at $880,000, up from $850,000 last December. Most notable is the seasonal increase in 2018, which drove up prices to $960,000. And while home prices do show a seasonal uptick during spring and summer months, 2018’s increase was relatively larger than the gains seen in the previous three years. Median home price changes, as usual, varied considerably across the region. 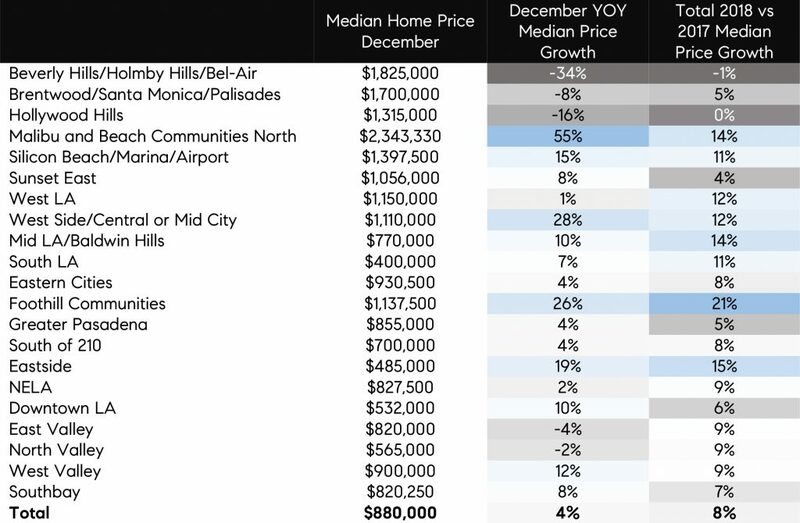 Figure 7 illustrates median home price changes in December by Los Angeles community and overall 2018 change compared with 2017. Again, while slowing after last summer, December’s median price posted a 4 percent increase over last December and an 8 percent overall gain in 2018. An area that stands out with more than a 20 percent increase in median prices are the Foothill Communities. 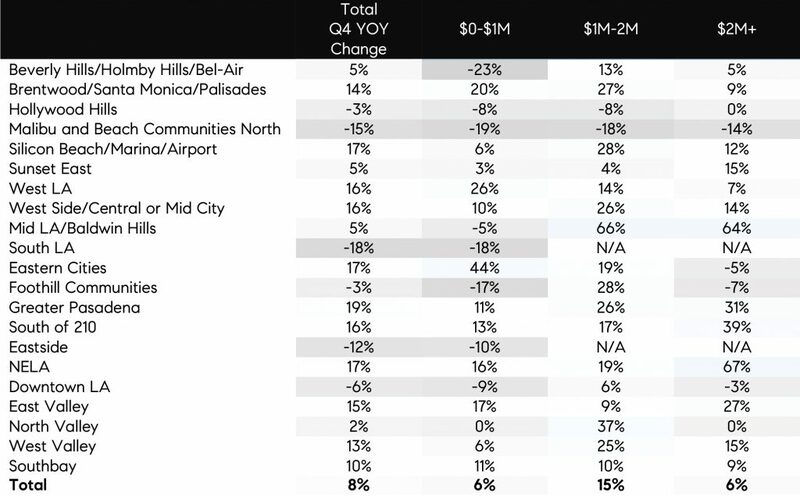 Communities that also saw double-digit-percent appreciation in 2018 include the Eastside, South L.A., Mid L.A./Baldwin Hills, West L.A., the West Side, and Malibu. In contrast Beverly Hills and the Hollywood Hills ended 2018 with median prices on par with their 2017 levels. through most of the year, holding back many buyers who were looking for a home. and buyer expectations was inevitable. more favorable year and more certainty around mortgage rates. Uncertainties remain though, as do questions around the government shutdown and its impact on housing and the overall economy. In California, the federal government employs 245,400 people, representing 1.4 percent of employed residents. And while that is a smaller share than in some other parts of the country, it is still an important part of the economy and represents a significant number of prospective Golden State homebuyers. Selma Hepp is Compass’ Chief Economist and Vice President of Business Intelligence. Her previous positions include Chief Economist at Trulia, senior economist for the California Association of Realtors, and economist and manager of public policy and homeownership at the National Association of Realtors. She holds a Master of Arts in Economics from the State University of New York (SUNY), Buffalo, and a Ph.D. in Urban and Regional Planning and Design from the University of Maryland.